Hide and seek is a game played by nearly every child, me being one of them. I never thought a simple game would change the way I thought about life. When I was 10 years old, I was a very curious and daring boy; I simply had no fear. Very much like the friends I spent time with. I lived in Clarksville, a quaint town in the middle of nowhere. My friends and I would always joke about how nobody ever came into or out of the town. My friends and I were always outside playing games, doing what kids do. Our moms would call us in for supper and we would say goodbye until the next morning when we would do the same thing again. But my friends and I were getting bored of the same old games we would always play, so we came up with a new way to occupy our adventurous minds. We decided that everyone would come to my house the next day and we would play a big game of hide and seek. Everyone was very excited about it; it was all anybody would talk about at school. After school, all twenty of the kids made their way to my house at around three o’clock. We quickly agreed on the rules and we were on our way. 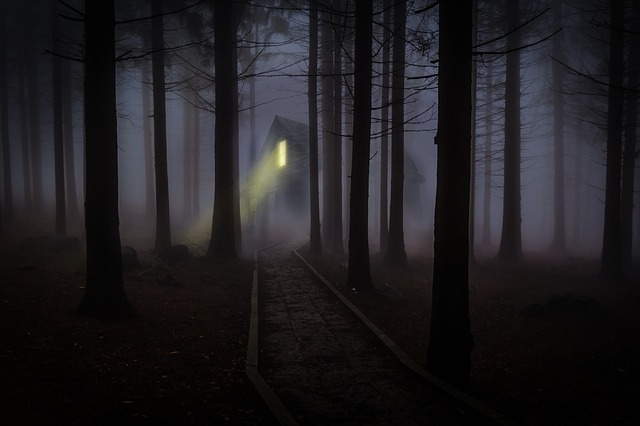 My house was surrounded by dense brush with a trail that led deep into the woods, thus making it much harder to be the “seeker.” I was in the group of eighteen to hide first, and we set out into the woods to find the “perfect” hiding spots. I knew this was going to be a game of the utmost intensity when kids ran past the yellow marking of the old oak tree marking my property. I was determined to find the perfect hiding spot, so I ignored my Mom’s warning to never go past that old tree. As time went by, the giggling and the sounds of the other kids’ feet running on the fallen leaves faded and I found myself walking in no particular direction, still trying to find the perfect spot to hide. As I looked around, all I saw were trees. Suddenly, something in the distance caught my eye. I couldn’t quite make out the object, but I sprinted toward it, fearful I would be caught by the seekers while exposed out in the open. The harder I ran and the closer I got, I realized it was a house. The smoke coming from the chimney told me someone was inside. “I didn’t know we had neighbors so close,” I thought to myself as I walked towards it. Suddenly, a woman who looked to be in her early thirties appeared and told me to come inside and get out of the cold. Although my mom had always told me never to talk to strangers, this woman didn’t seem like a threat. I felt like I knew her, so I went inside. Beyond the front door was a beautiful, well-kept house. I was amazed at the utter antiquity of the house; it felt like I was stepping back in time. However, I didn’t think anything of it and continued to have a friendly conversation with the young woman over a cup a cocoa. In the background, I heard the faint crying of a baby. This made me curious. When I had finished my cocoa, the woman proceeded to give me a tour of her old house. As we walked from room to room, I realized one peculiar thing: The house had no windows! None at all! Something wasn’t right. Looking back, I didn’t think it was as strange at the time as I do now, but the house itself let in zero light from the outside. As we continued walking, I started thinking about this peculiar feature and about the fact that I’d never heard about this woman or this house before. I started doing a little investigation, or the best investigation a ten- year old could do. I noticed small details–how the woman was wearing a corset-fitted dress and a bonnet with her hair tied back. The clothes clearly didn’t seem to fit with the time. When I asked the woman when she had moved to Clarksville, she exclaimed, “My husband and I have lived here for years!” I found this strange because, having lived there my whole life; I figured my mother would have told me about her. The more of the house she showed me, the more suspicious I grew. She led me everywhere and still I didn’t see a crying baby. Just when I thought the tour was over and I would be on my way, she told me I hadn’t seen her favorite part of the house yet. I was wondering what more was left, because it seemed as if I had seen every inch of the house. Soon, I realized that there was a long stairway going into the damp smelling basement. When she opened the basement door, I heard the crying more clearly. I shuddered. I knew I couldn’t go down there. I told the woman that I needed to go home, but she was convinced I had to see the basement. When I told her I needed to leave again, she kept repeating, “But it’s the best part!” I knew I had to get out of there, but I didn’t know how to escape. I sprinted towards the door, but she made it there before me, blocking my way. In a moment of panic, I pushed her aside and darted out the door. As I ran back through the woods, I heard her yell, “Don’t leave me!” I didn’t’ dare look back. When I could no longer hear her, I glanced back. The house wasn’t there! It had gotten so dark out, I thought my eyes were playing tricks on me. P.J. is an average student at Voorheesville High School. He plays three sports and aspires to go to college.